Light up your chandeliers and open your ears for a FREE illuminating, fun and unique evening on King Edward Avenue, Blackpool. Join us on Saturday 28 October for the FREE performance of a new work by Dan Fox and associate artists, commissioned by residents of King Edward Avenue. Chandelier night is an illuminated walking performance that will take you on a tour of King Edward Avenue like you’ve never seen it before. Projections and a four-piece costumed live band will explore the trials and triumphs of B&Bs in King Edward Avenue celebrate the stories of this special place. Exploring the stories of local landladies and ending in celebratory dance, it will be an unforgettable evening. Artist Dan Fox was chosen to develop a new bespoke piece of work and the group felt that the story of King Edward Avenue was a powerful and joyous part of our history. Dan used this to develop a new work in a playful and unusual way. 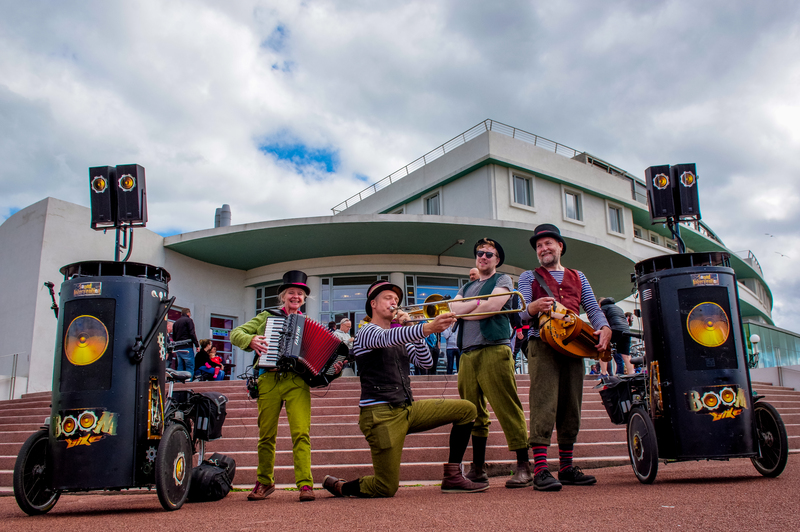 Starting from the promenade end of King Edward Avenue there will be two performances at 6.30 and 8.30pm – each performance will last 45 minutes. Chandelier Night is one not to be missed and includes procession, music, digital projection, LED lighting, amplified sound, live music and dance. Projector “BoomBikes” will be riding on the road and projecting onto properties on either side of the street accompanied by live music by the band. The audience will be treated to comic animations with a soundtrack of collaged voice recordings played through the BoomBikes. The procession will end with an open air dance at the crossroads of Holmfield Road and King Edward Ave. This will last approximately 20 mins with ceilidh style called dances accompanied by Boom Bike Bourrée playing through the Boom Bikes. King Edward Avenue will be closed to through traffic and street lighting will be turned off between 6.00pm and 10.00pm to allow the performances to take place.